I have, in all seriousness, made this dish at least once a week for the last month. It is so quick, and so much like a warm, creamy comfort food, that it is almost impossible to believe that it's pretty healthy as well. It reheats well for packed lunches and second dinners. Plus it's cheap to boot, which means I am now in the habit of constantly stocking cream cheese and smoked salmon trimmings. 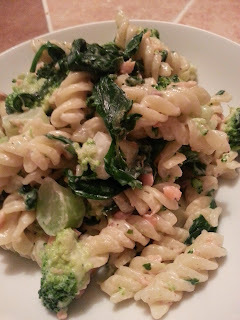 I particularly like broccoli in it, though tonight I added in spinach as well which made it seem extra virtuous. I'm sure we'll get bored of it at some point, but for now, I'm going to stuff myself with this dish. 1. Bring a large pot of water to boil (one large enough to hold all of the pasta and veg comfortably). Add a generous amount of salt to the water, the way you would when just cooking pasta. 2. While you are waiting for the water to boil, wash the broccoli and cut it up into small chunks and florets. You can use the entire stalk in this dish as well, as long as you cut it up into small bits so it cooks through. 3. Add pasta to boiling water and cook for 7 minutes. Add broccoli and cook for 3 minutes more. If you're adding spinach, pop that in 1 minute before everything is done. 4. Drain the pasta and veg. Return it all to the pot and then stir in the cream cheese and smoked salmon. Add pepper to taste. Dive in.